Here is a little infografic that may help you identify the correct freestyle technique and different types of faults that you are subject to as you learn to swim. The second picture (from top to bottom left to right) is a bit hard to see what the faults are because of the angle the photo is taken on. But it is basically that the swimmer has his hand turned too much and it will require adjustment once it has entered the water or it will reduce the amount of pull it can get from the water. 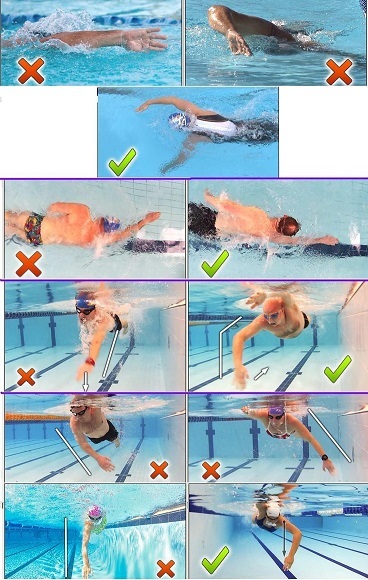 Whereas in the third frame, the swimmer's hand has entered the water so that it can immediately start the pull. I think the rest of the frames are straight forward and show clearly the faults.